So I got this allotment. The permaculture way I suppose would be to haul in a ton of material and cover the soil completely with layer upon layer to suppress weeds until they die through a lack of sunlight. Without that amount of composting material, however, I soon found all kinds of stuff emerging from the soil. One thing I’m really happy about is my herbs. And a couple of plants I didn’t plan for. My predecessor on this allotment let everything go to seed and afterward everything on site was dug into the soil. So I got some free onions which I transplanted for their second year in the soil. And quite a few coriander plants spread all over the site. Then there are a couple of plants (yes, weeds) I don’t mind – if there are a few of them. However a few isn’t what I got. Every bit of root of the stinging nettles on the site sprouted. So far I think I’ve pulled up 4 bucketloads of stinging nettles and grasses…hang on… 5… but it’s down from a bucket a day a bucket per week. Just about. And that’s just stinging nettles and grasses. And then there’s a plant I once looked up and it appears to be called Lady’s thumb, of which the leaves are apparently edible. Unfortunately I was raised knowing a limited number of vegetables which were readily available at the supermarket and not too much hassle to prepare for dinner (that’s my guess). So trying out new stuff is something I’m very cautious about and there’s veggies in the shops I haven’t even got round to tasting, let alone stuff that grows spontaneously all over the place. Since this Lady’s thumb isn’t my biggest worry, I leave the plants to dry on top of the soil. Horsetail doesn’t seem to be on the list of edibles… more’s the pity. I did get some plants to grow – finally! I’ve got chamomile, thyme, dill growing happily underneath a couple of young apple trees. And seleriac. I grew a couple of lychee plants from their – well – beanlike seeds. Two of them have survived the transplant into the allotment so far. And I’ve got leek flowers to look forward to, from leftover leek stems I planted last year. I had hoped to add a picture here, but I’m still waiting for them to flower. Which is why I’ve added a couple of photos of my (mainly) tulips under the hedge – I dug some more into the spaces underneath the hedge this year, which turned out great since the new tulips produced their blooms around the time the ‘veteran’ tulips had gone over. The anemone was a nice surprise. All things considered, I greatly respect weeds for their resilience and speed of growth the moment any rain falls. It would be easier to like them if their numbers were fewer though… after I planted a few young plants and watered them daily for a week because we had virtually no rainfall, guess what I got? In less than half a square metre there were dozens, no, well over a hundred little weed seedlings popping up. In just that small patch. And I’m not even sure these are edible. Apart from that, it’s strawberry season over here! And I got a couple of wonderfully sweet raspberries too, from a bush that delivers fruit from june (to my surprise) well into november. I wonder if there are several raspberry shrubs hiding in the same patch? 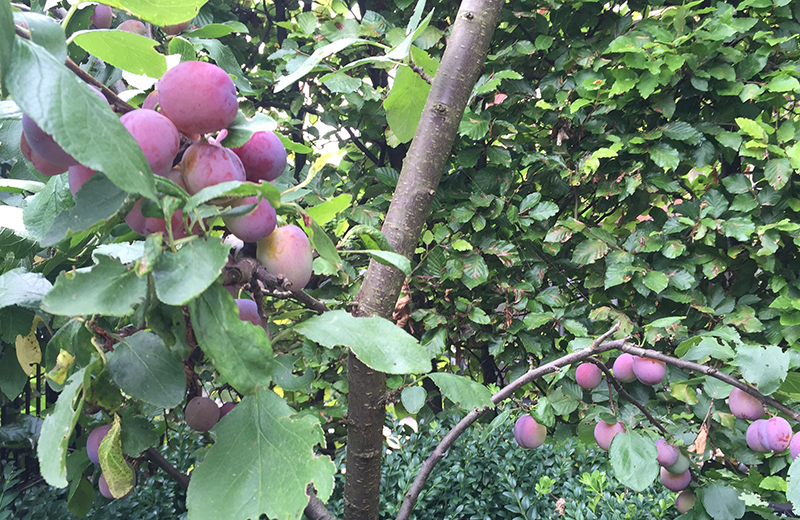 Our little plum tree, after the first plums had been picked. Summer is such a great time to be outdoors and watch the plums ripen. Which is exactly what I did for about two months – apart from trying to get my allotment strawberries out from between loads of weeds (well, grass actually. But not the nice stay-in-one-place grass you get in lawns. The other, ambitious, conquer-the world kind. My mistake). And one day a plum was lying on the terrace. Ripe as anything. Plum harvest time! It’s about time for an update on my bulbs under the hedge! Since we’ve got a beech hedge which looks rather brown and drab in winter, I decided to try to bring a splash of color by planting flower bulbs underneath and in between the plants. And then winter hit. Or rather, it splashed. It was so bad I’m still wondering how the neighbors’ grape vine didn’t drown. 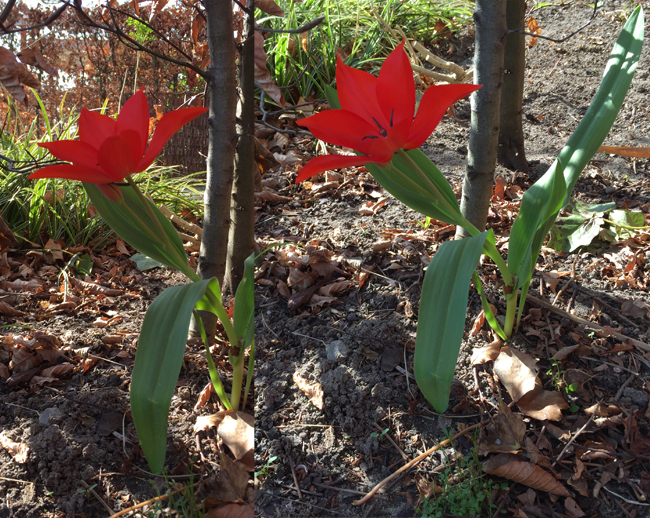 The big question was whether the bulbs were in any way affected – and which ones, if any, were going to give a sign of life in spring. The bad bit? I haven’t seen many anemones under the hedge. Perhaps those small bulbs just got soaked and rotted away, I can’t tell. The good news? The tulips did very well. Mind you, these were tulips from a package that said they grew 20 centimetres tall. They didn’t. Not here, anyway. 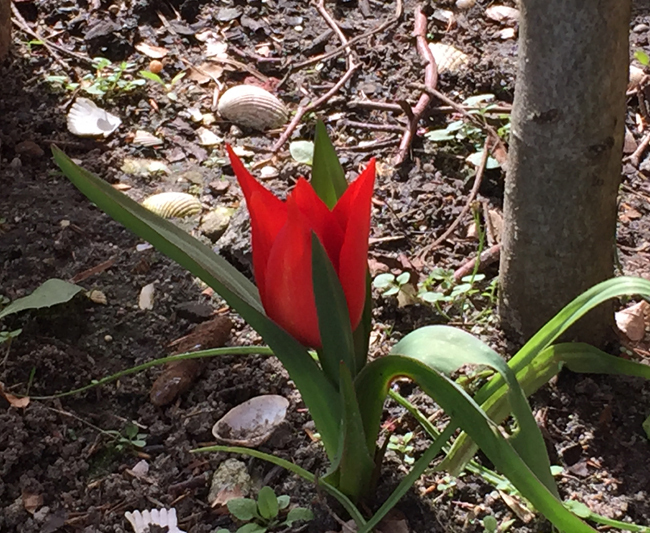 The first tulip started to blossom almost as soon as it was out of the ground. But then it kept growing nearly 35 centimetres – without the flower. Here it is from two different angles. Any regrets? Well, yes. I regret the flowers are gone now. And I especially regret I didn’t put in more tulips! They have done so well and on rationed sunlight, too. I put them in sparingly in shady areas and the one side-effect I’ve noticed is that the flowers didn’t get bleached by the sun. They stayed the same firy red hue. Whereas the tulips in full sunlight looked great (with anemones and crocuses) but they didn’t quite keep the same richness of color. Have you got flowers in odd corners of your garden? Or plants you thought would be lucky to survive in the spot you gave them? When I first started blogging, I decided not to blog about me. For more than a year, that worked really well. But then something happened. And it changed everything. Photos from the garden yesterday afternoon. Call this winter? At ankel’s height there’s still lots to see. Bulbs reaching up. A cold snap with a drizzle of snow caused stubborn flowers to droop. Over a year ago I got a new job. In content management. A great opportunity to turn all my talk about content, social media, and the like, into my daily job. But somehow, spending hours at work fiddling with texts doesn’t motivate one to sit down at night and do the same thing all over again. Writing about content wasn’t the only problem. It was the editing, finding the right picture, and so on. I’d added some plants but never sat down to decide which bigger plants might really add structure to our garden. It almost felt impossible to put big plants into a small garden. Partially because it would mean ripping out weeds that had grown on me. Sort of. Some of them. Partially because, well, it’s a small garden. Big plants were never going to fit, right? But here I am after trying stuff in my garden for a whole growing season. I put in bigger plants and I keep seeing patches where more plants would fit quite snugly. 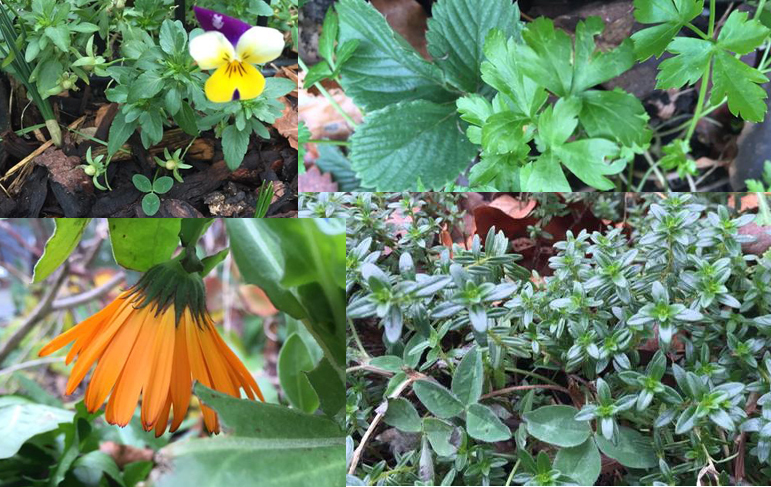 I also started blogging about my garden. Looking back at some pictures I took a few years ago I noticed one thing. A lot of small plants have disappeared. Having bigger plants shade the soil and soaking up nutrients and water has probably meant that the smaller ‘pioneer’ plants have left – after depositing their seeds in case a big shrub or a treelet is uprooted by a storm. I’ve been able to retain a red clover, so hopefully it will attract bees and the like next spring. The gaps left by the pioneer plants are now begging for inhabitants -they are an open invitation for our neighbors’ cat to crap right in that spot (they don’t have a garden. Just a place to sit outside. And a cat with toilet issues). That’s one thing about some of the herbs: they die back when it gets cold and then the cats move in. Plants with woody stems are better. Looking forward to spring. Happy New Year! The bulbs have been planted… or most of them have. Unfortunately it looks as if it will be too cold this weekend to go digging and planting the last of my bulbs. Still, not to worry – a couple of warmer days next week are enough. For the past few weeks I’ve spent time digging tiny and not-so-tiny holes in the ground in my garden… planting bulbs. 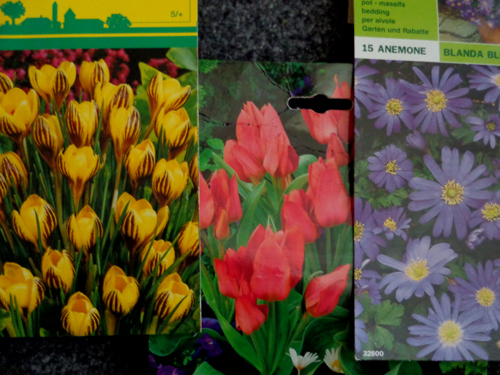 If you’ve visited my blog before you may have noticed I wrote I don’t have that much space, so where do I leave bulbs? Bags and bags of flower bulbs… these are a couple I selected for the back yard. These didn’t all fit exactly under the hedge.